Ever had the feeling that your world’s been turned upside down? Literally? Writer Paul Gallico had a taste of it in 1937 as he was crossing the Atlantic on the luxury liner RMS Queen Mary. He and his fellow passengers were sitting down to lunch when three freak waves hit the hull, knocking the ship on its side. Crystal glasses, plates and people all went flying. Fortunately the old girl righted herself and she steamed shakily on but what if she hadn’t? What if she’d flipped right over, say, on New Year’s Eve, round about midnight? Gallico mulled on this scenario and, three decades later, wrote it down in a sensational novel which captured the attention of producer Irwin Allen. 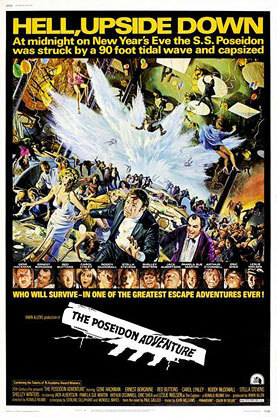 With a budget of just US$5 million, Allen launched The Poseidon Adventure on the big screen in vivid De Luxe colour, using the retired Queen Mary herself for many of the exterior scenes. British director Ronald Neame was at the helm, steering his traumatised cast and crew full steam ahead. Gene Hackman stars as the renegade Reverand Scott alongside Ernest Borgnine as the tough nosed detective Mike Rogo and Shelly Winters as the loveable, weight obsessed Mrs. Val Rosen. The other three female leads appear to have been chosen for their shapely legs which are frequently featured in hot pants or knickers climbing up various ladders throughout the upturned vessel. And Winters also gets to show off hers when she executes an underwater rescue in the ships’ flooded bowels, a feat she performs with finesse having been taught to swim by none other than Johnny Weissmuller. Since the film’s release in 1972, there have, of course, been other, more technically sophisticated and bigger budgeted disaster movies set on the high seas like Titanic which make The Poseidon Adventure seem rather clunky in parts but, in a funny way, that only adds to its appeal. Production Designer William Creber literally picked up part of the set with a fork lift to create the effect of a ship’s ballroom capsizing and a simple rolling camera made the static ship look like it was in perpetual motion. Coming soon is the remake by Wolfgang Petersen who directed another brilliant shipping disaster movie, The Perfect Storm, but without the original’s Oscar winning theme song, ‘The Morning After’, can it possibly be as good? Others may have eclipsed it with their computer generated imagery but this old salty sea dog remains the prototype.